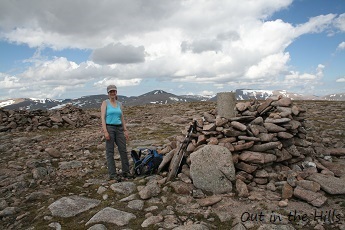 Braeriach - we head to this Munro summit in the western part of the Cairngorms which has the most spectacular corries and cliffs of all the Cairngorms, that supposedly held permanent snow until the 19th century. Braeriach and Cairn Toul - a longer version of the above walk, this takes in three of the Cairngorm Munros: Braeriach, Sgòr an Lochain Uaine (Angel's Peak), and Cairn Toul, involving a walk above Braeriach's spectacular corries, followed by a descent to Glen Feshie. 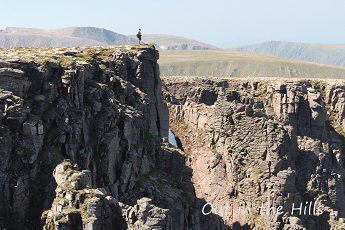 It's not for the faint hearted, as there are few short cuts, but we are rewarded with some of the best views in the Cairngorms. Ben Macdui and Cairn Gorm, plus Derry Cairngorm or Beinn Mheadhoin - a bigger version of the Ben Macdui and Cairn Gorm day, with maybe an additional Munro or two. Fords of Avon and Loch Avon - a long walk into the imposing basin of Loch Avon via one of the old cattle droving routes, then back down Strath Nethy. No summits on this walk, we're at a lower level, but the going is rough in some places, and we get spectacular views of Shelter Stone Crag. The Monadhliath ("grey mountains") above Newtonmore - there's the possibility of three Munros on this walk across undulating high moorland. Beinn Bhrotain and Monadh Mòr - a long walk across the Mòine Mhòr ("big bog") to these two Munros in the heart of the Cairngorm plateau. Cost depends on the planned length of walk: from £100 per person, discount for 3 or more. Transport from the Aviemore area is included.